Why is it so wondrous? I would be terrible and say that you need to watch it for yourself, but I’m a nice person, so I won’t do that. Jk, the truth is, my limited eloquence only goes so far, and words simply cannot describe the sheer awesome of this show. But..to start, every single cast member, down to the comatose dog [oh wait, wrong Sherlock], executes his part with flawless finesse. Benedict Cumberbatch, Martin Freeman, and Andrew Scott incessantly impress me throughout the series. [And I can’t help it that Cumberbatch’s voice and eyes cause whatever resides in my chest to melt like chocolate on a hot day (summer’s approaching..not cool—no pun intended)]. Fun fact: Cumberbatch’s voice was what finally tipped the scale in convincing Endodo to watch the first episode. Anyways…………..moving on. Every episode in the two [all-too-short] seasons has an utterly mind-boggling effect. 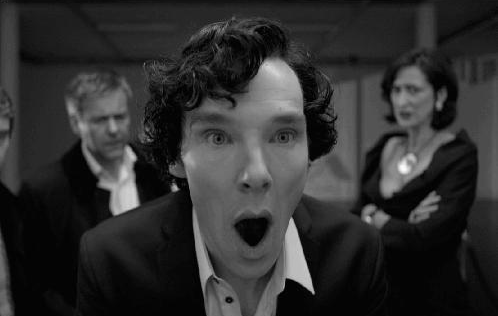 Besides the inherent genius of Sherlock’s character, the creators incorporate a plethora of subtleties and nuances that, when discovered, cause one to have a string of mind-flips. This is one of those things that I can watch a thousand times for the rest of my life and probably still not uncover everything hidden within it. Basically, everything about this show is brilliant. There’s a mastermind, his unfailingly loyal friend, and a psychopath [we know how much Arwen loves watching those]. We have wit, comedy, intelligence, along with moments that will again melt you into a puddle of mush. By the second season, you’ll be on a roller coaster of sensations [and partly hate the writers for being so emotionally abusive] while continually being in shock/awe/amazement/dumbfounded..ness..[?] at Sherlock’s racing engine of a brain. This entry was posted in Miscellaneous/Obsessions, Sherlock Saturdays and tagged Andrew Scott, BBC, Benedict Cumberbatch, crime drama, Jim Moriarty, John Watson, Mark Gatiss, Martin Freeman, Sherlock, Sherlock Holmes, Sir Arthur Conan Doyle, Steven Moffat by Tiffany. Bookmark the permalink. Thanks for updating my bloggy, bestie! Excellent endorsement for our favorite genius detective. Reblogged this on The Science of Fandom. Yay for a new post! I’ll have to check this out.